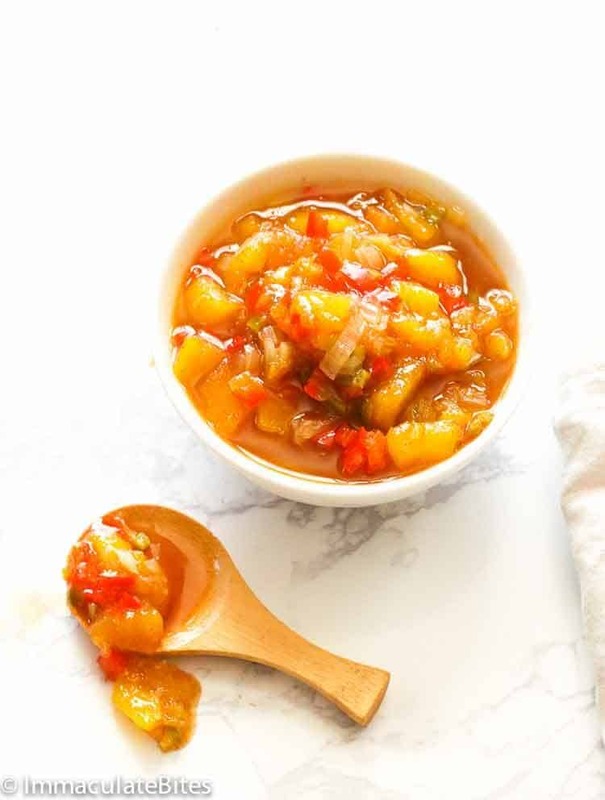 Mango Chutney – An easy condiment that is great with chicken, fish, shrimp, sandwiches and as a dip. Made with sweet juicy ripe mangoes, ginger, peppers, coriander, cinnamon and more. A condiment with complex flavors that blends well together! 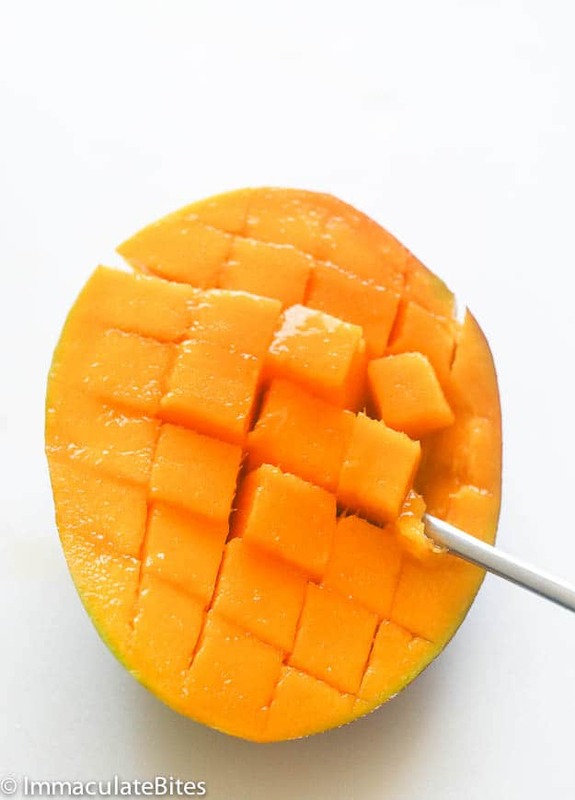 You most likely think of mangoes as great in smoothies and salsa.The good news is that there are many more options available to help you re-discover this summer produce which is a favorite of mine. Do you know that one great way to use it up is by making chutneys at home? Have you ever tried making chutneys? It’s a great condiment to have around the house. It‘s sweet and spicy.! Works well as spread on sandwiches, for dips and great accompaniment to barbecues and baked proteins. An additional bonus is that you can use a variety of fruits to make chutneys. Spicy – ginger, garlic, peppers and an array of spices, used according to an individual’s preference and/or spice tolerance level. Sweetness – comes from the fruit and/or the added sugar. See how flavorful it is? It’s complex, yet the flavors meld beautifully into one. All of these ingredients fused together form one heck of a a tasty condiment. That will surely make anyone take notice. I bet you would! The best part? It is easy to put together! Simply throw everything in a saucepan, bring to a boil and let it simmer until it thickens up. How’s that for EASY? 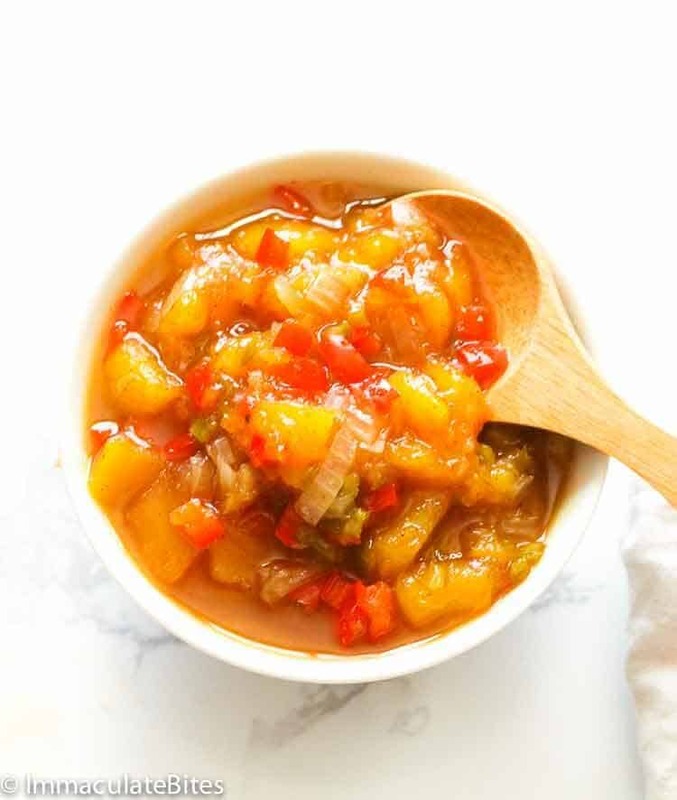 Now is a good time to try this Mango Chutney, with the abundance of mangoes this time of the year. They are everywhere, dirt cheap. Or just use pineapple chunks, frozen or canned works just as well. 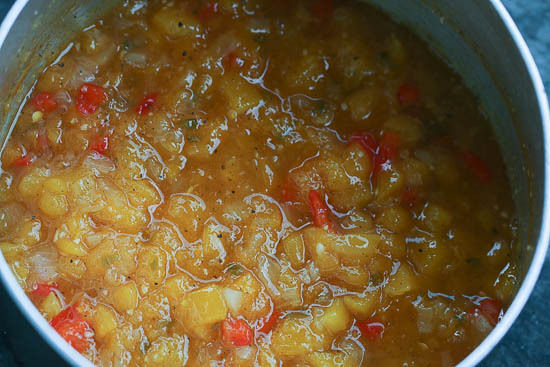 I made the pineapple chutney paleo.I used coconut sugar and lemon juice in place of the vinegar and it doesn’t disappoint, so if you want a paleo option you can switch up the sugar. A great tasting way to enjoy this as a snack is by topping a piece of bread with smashed avocados and chutney. It is a great appetizer! You can eat mango chutney as a sandwich spread, on crackers with proteins like pork chops and even as a salad dressing mixed with mayo and a bit of curry. You can also explore other chutney flavors like, raisin, tamarind, citrus fruit, peach and apricot. Make sure to use non-reactive pots when making chutneys as the acids in the mixture will react with the pot thus adding a sort of metallic taste to your chutneys. You can use green mangoes, too. Adjust sugar if you want to amp the sweetness. Sterilize and clean the jars before storing chutney in it. 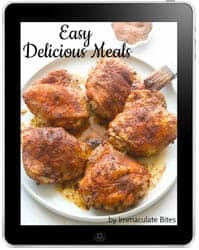 Recipe was first published on June 2015 and is updated with relevant notes and tips and new photos. 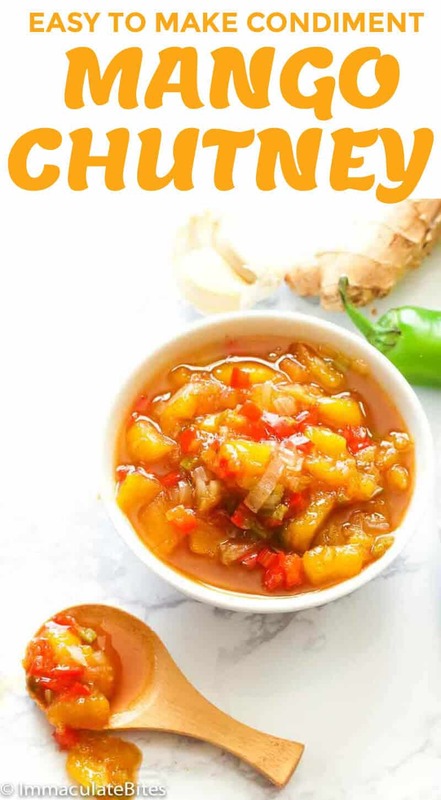 Mango Chutney - An easy condiment that is great with chicken, fish, shrimp, sandwiches and as a dip. Made with sweet juicy ripe mangoes, ginger, peppers, coriander, cinnamon and more. 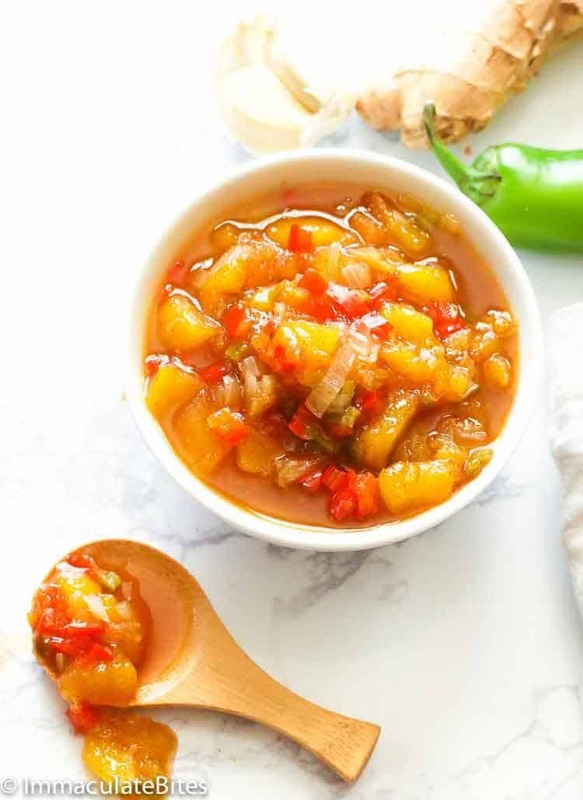 A condiment with complex flavors that blends well together! 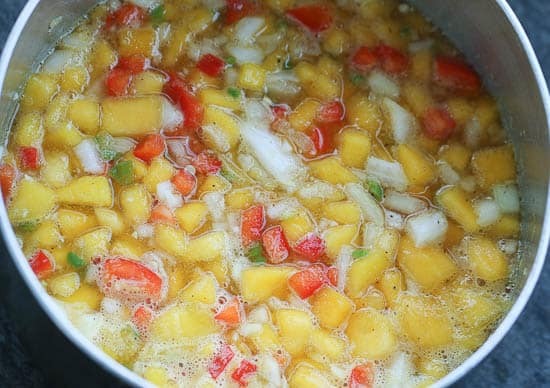 Combine mangoes, ginger, garlic, onions, Jalapenos, bell pepper, ginger, spices, sugar, vinegar and water in a large stainless steel sauce- pan. Bring to a boil, then cook, uncovered for about 20 minutes or more, until tender and the sauce thickens. Remove let it cool, refrigerate and start using. Will last more than a month in the fridge covered. 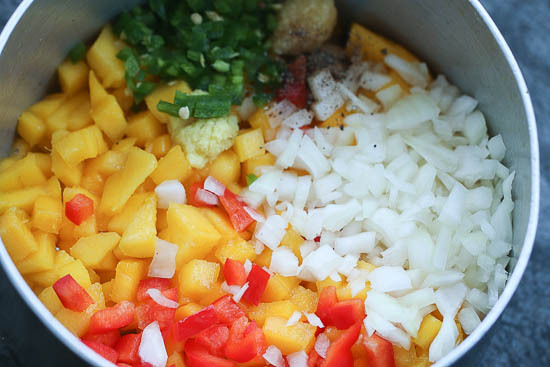 Combine mangoes, ginger, garlic, onions, Jalapenos, bell pepper, ginger, spices. Followed by sugar, vinegar and water in a large stainless steel sauce- pan. Bring to a boil, then cook, uncovered for about 20 minutes or more, until tender and the sauce thickens. So interesting and enjoyable indeed. Do you think the finished chutney could be frozen for use during the winter? 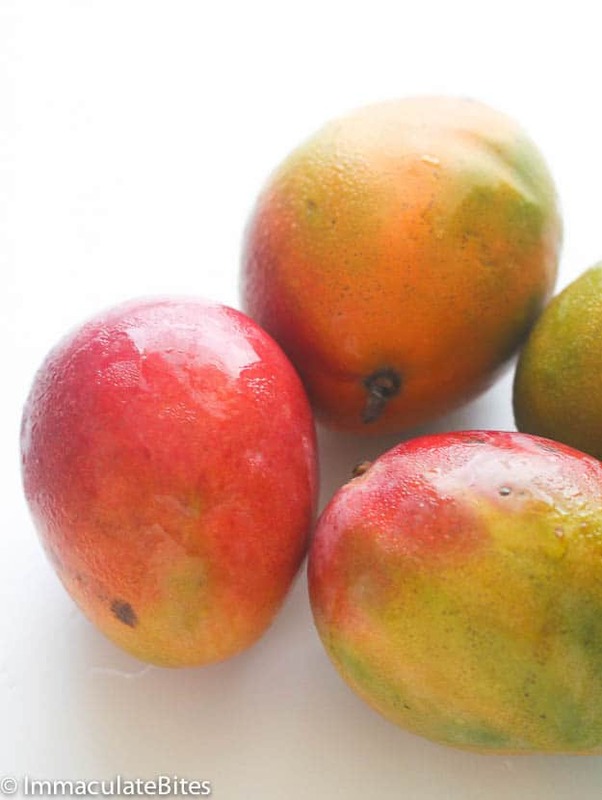 Can you make mango chutney sign green mangos? Hi, Mariger! I haven’t tried using green mangoes for chutney using this recipe. Sweet ones are preferred for this recipe as they complement well with the pineapples. I made this chutney and it was delicious, quick question, how long will it keep, in the fridge in air right jar?